"You will never want to buy fries anywhere else after you see how easy and delicious they come out at home! You can actually taste the potatoes and not the bread crumbs, oil, and salt. Add any other spices of your choice." Preheat the oven to 425 degrees F (220 degrees C). Line a baking sheet with parchment paper. Pour olive oil into a large resealable plastic bag and add potatoes. Seal the bag and shake to coat every piece with oil. Combine Parmesan cheese, garlic powder, onion powder, paprika, salt, and pepper in a second resealable bag. Pour oiled potatoes into the bag, seal, and toss well to coat. Spread potatoes on the prepared baking sheet. Bake in the preheated oven for 15 minutes. Flip potatoes over and bake until crisp on the outside and soft on the inside, about 15 minutes more. 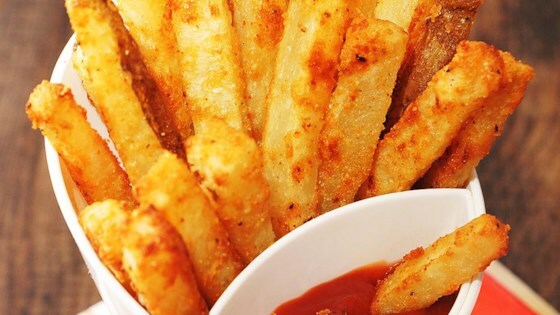 See how to make crispy, crunchy, healthier French fries. For the garlic parmesan fries it mentions bread crumbs....does it have it in the recipe? candyroaster@hotmail.com would appreciate an answer. Thank you in advance. Very good! To be mindful of plastic which is banned from my kitchen, I just do the mixing with oil and spices in a bowl. We followed to the "T" and where wonderful, even the picky eater loved them! Will make again! These came out perfect!! I have nothing to add or take away. Just perfect! I did this in wedges and it was amazing. Made it exactly as prescribed and was fabulous hubby loved it! !